2 Ingredient Pancakes have been showing up all over the internet lately. Low carb pancakes that are easy to make, and tasty as can be, we’ve been making these 2 Ingredient Cream Cheese Pancakes for years. 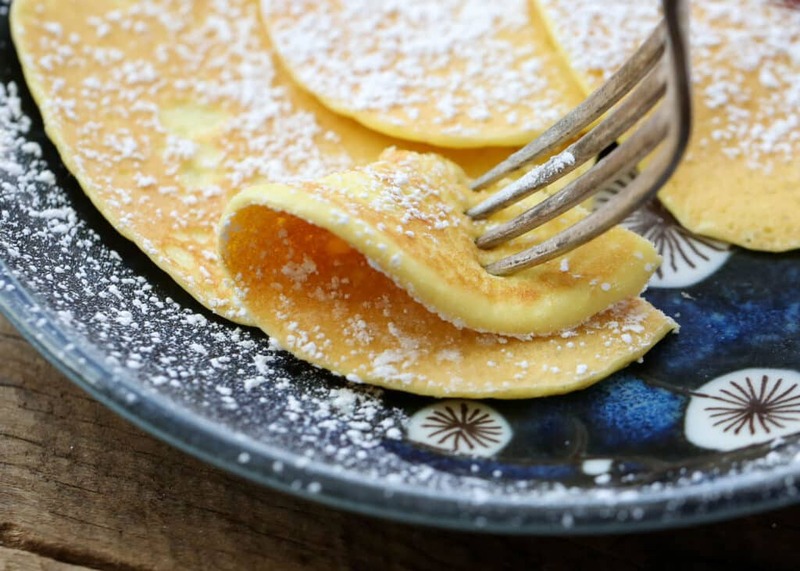 Amazingly thin and delicate, these cream cheese pancakes are much closer to a crepe than a traditional thick and fluffy pancake. I like these pancakes best when simply dusted with powdered sugar, but by all means, try my buttermilk syrup. They are also delicious when drizzled with maple syrup or honey, or you can go crazy and put peanut butter and jelly on top. Whatever floats your boat and your diet works here. 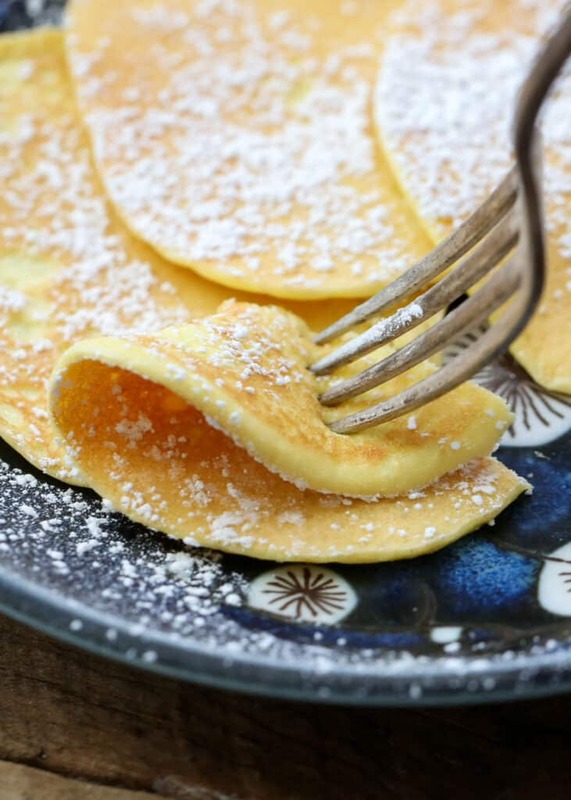 These simple low carb pancakes are a completely different kind of breakfast treat, and I loved them from the first bite. My kids did too. They don’t care if they’re low carb or not, they just want them in nice tall stacks on a Saturday morning. I first stumbled across this Cream Cheese Pancake recipe about five years ago reading I Breathe I’m Hungry. I whipped them up the very next morning for much smaller boys than I have now, and they’ve been a regular item on our meal plan ever since. Having now tried the popular 2 ingredient banana pancakes as well, I can tell you beyond any doubt that 2 ingredient pancakes made without banana are my favorite hands down. These delicate cream cheese pancakes are basically the world’s easiest crepes made with little more than eggs and cream cheese. Seriously, that’s the ingredient list. Now, I have a lot more complicated pancake recipes around here. Technically these pancakes are gluten-free, but I also have a more traditional Light and Fluffy Gluten-Free Pancake recipe too. And then there are the Cranberry Almond German Pancakes with Orange Syrup. Those are definitely for when you’re feeling fancy. But that Saturday morning when I first made these pancakes? I was definitely not feeling fancy. I wanted breakfast on the table, and fast, so we could get out the door. 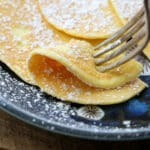 This recipe is almost absurdly easy and I’ve now been making these pancakes for several years now. In literally 5 minutes, I can have a batch of pancakes ready to serve to the first hungry person to the table. My boys flipped out (see what I did there?) as soon as they hit the table. They both said they were awesome and devoured them just as fast as I was flipping them off the griddle. If you’re anything like me, you’re always on the lookout for new breakfast ideas. I wanted something that wouldn’t leave me feeling overly full first thing in the morning, and these pancakes were exactly what I was hoping they would be! When breakfast is this amazingly easy and truly delicious, life is good. I’ve been busy imagining new sweet and savory toppings for these simple 2-Ingredient Pancakes for years now, and I’d love to hear what your favorites might be. You can easily double or triple this recipe (and probably should, since they freeze well, so long as you place wax paper between them), but it’s also super easy to pull together another batch while your crew is busy finishing off the first one. Yes – they’re that easy! What I love even more is that I can just throw the ingredients in a blender, and pour directly onto the griddle from there. Add cream cheese and eggs to a high-powered blender. Blend on high until ingredients are completely combined and smooth. Allow the batter to rest while you heat the griddle to 375°F or medium-high. Butter the griddle and pour about two tablespoons of batter onto the griddle plate once the butter is melted. Allow the batter to cook on one side until just golden, then flip (about 2 minutes), and cook on the other side for about another minute, until both sides are golden. So let me hear it! What would you serve with these delicious, low carb, high protein pancakes? If you’re looking for more pancake inspiration, don’t miss these fun Cinnamon Roll Pancakes and Banana Nut Sour Cream Pancakes – they sound delicious! Put the eggs and cream cheese into the blender. If you want any additional flavors, add them now. Blend until smooth. (This takes just a few moments.) Let the batter rest a moment while the griddle heats. Butter the hot skillet or griddle and start by pouring just an 1/8 cup (or two tablespoons) of the mixture onto the hot surface. Remember that it will spread out a lot; these are very thin pancakes. Cook them for just a couple minutes on the first side, just until golden, and then carefully flip and cook another minute or so on the other. Once you have a feel for the way these cook, proceed to make them as big or small as you like. Plate them and then sprinkle, drizzle or dust with the topping of your choice. Enjoy!